Elster AMCO Water, Inc., is unveiling its evoQ4 mag meter at ACE08. Product demonstrations can be seen at Elster AMCO Water’s Booth No.1401. On June 9, two Product Information Forums will be held in Exhibit Hall B featuring presentations and product demonstrations on evolution™ AMI (1 p.m.) and evoQ4 (4 p.m.). The evoQ4 mag meter delivers the functionality of four traditional commercial meters – Compounds, Turbines, Single Jets, and Mag Meters. Embedded with sophisticated measurement technology, the evoQ4 mag meter provides high accuracy through a wide range of flows. The evoQ4‘s wide flow range is accomplished in part by a high-resolution, 0.5 second sampling rate. Fully submersible, solid state, lightweight, and with a 10-year battery life, the evoQ4 is designed to measure accurately without the need of moving parts, eliminating the need for calibration, battery change-out, or any type of regular maintenance that may be required with traditional mechanical and electromagnetic meters. Koch Membrane Systems, Inc. will showcase its MegaMagnum reverse osmosis (RO) and nanofiltration (NF) systems for industrial and municipal applications and its PURON™ submerged membrane modules for large-scale membrane bioreactor (MBR) applications in Booth No. 435 at the ACE08. The MegaMagnum RO and NF systems use 18-inch diameter MegaMagnum membrane elements, the world’s largest spiral-wound elements, to significantly reduce the cost, footprint, and installation time of municipal and industrial water treatment systems. The 1,500-square-meter PURON module is designed for MBR applications and features greater membrane packing density, lower energy costs for aeration, and simplified installation while providing even greater compatibility with other commercially available systems. Marking an industry first, onboard pump intelligence is now a standard feature of the ANSI Model 3196 process pump from ITT. The company will showcase some of its products at Booth 901 at ACE08. The i-FRAME provides operations personnel, maintenance managers and reliability engineers with early warning of trouble so that changes to the process or machine can be made before failure occurs. The i-FRAME’s stainless-steel condition monitor is nested securely atop the power end to measure critical vibration and temperature readings. Variations in temperature or vibration that exceed preset parameters will activate the early warning system by displaying flashing red lights, easily recognized during routine walk-arounds. 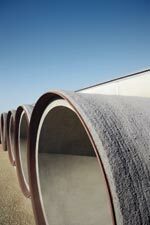 Hanson Pressure Pipe’s L-301 Prestressed Concrete Lined Cylinder Pipe is used for all municipal water and wastewater applications as well as industrial piping. It combines concrete’s high compressive strength and steel’s high tensile strength, creating a durable structure equipped to meet any project’s requirements. For more information, visit Booth 1629 at ACE08. Fluid Imaging Technologies is introducing the FlowCAM particle analysis system at Booth No. 2445 at ACE08. The system automatically detects blue-green algae (cyanobacteria) so treatment can begin much faster, before there's a dangerous bloom. The FlowCAM® cell and particle imaging and analysis system boasts a new breakthrough, patent pending feature that automatically detects the presence of cyanobacteria in water, takes hi-res, full-color digital images of each individual cell, differentiates the cells from harmless, non-toxic species of algae, and saves the images and measurement data for analysis. Ideal for continuous use monitoring reservoirs, lakes, rivers, and other source water and recreational locations in situ, as well as with discrete samples, the enhanced FlowCAM provides images and data in real time to constantly track the growth of cyanobacteria, sound an alert at its presence, and permit treatment before it can bloom and release its harmful, sometimes lethal, toxins into the water. In addition to causing a range of adverse health effects, these cyanotoxins also cause troublesome taste, odor, and water discoloration. The upgraded FlowCAM provides a proactive, preventative approach to cyanobacteria management that renders bulk fluorometers virtually obsolete. For more information, visit www.fluidimaging.com. UV disinfection specialist Aquionics will be showing its validated medium pressure InLine UV system at ACE08. A selection of Aquionics' other UV systems will also be on display, including a transparent model showing the internal workings of a UV system, such as the lamp wiper mechanism. Experts will be on hand at all times to provide technical expertise and answer questions. For more information, visit Booth 2835 at ACE08. 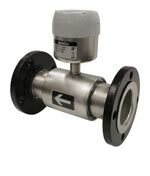 The Mc® Propeller Model MO300SW Reverse-Helix Flow Meter sheds a variety of organic and inorganic debris and resists sand typically associated with flow measurement in surface and water well applications to increase measurement accuracy, reduce maintenance requirements, and lower total operating costs. The MO300SW is a reverse-helix design propeller flowmeter that comes in a bolt-on saddle configuration suitable for use in line sizes from 4 to 12 inches. Delivering accuracy of +2 percent over the full flow range with +0.25 percent repeatability, the MO300SW offers accurate flow measurement and high reliability in the industry’s most popular 4- to 12-inch line sizes. For more information, visit Booth 815. Philadelphia Mixing Solutions will showcase its UniFirst™ 4040 Mixer and its Raven™ Mixer as part of its display at Booth 3149 at ACE08. The UniFirst 4040 is part of the company’s 4000 series, offering the water industry’s highest shaft-diameter to torque ratio. The mixer is designed to withstand excessive heat, harsh weather conditions, and fluctuating loads. The Raven 3800 series is engineered for maximum durability in mixing large solid concentrations and in caustic and corrosive environments. Its features include a closed grain cast-iron housing with open tank mounting configurations, input and intermediate shaft designs for reduced deflections, efficient and durable C-Face motors with piloted motor adapters to eliminate shimming at installation. Semaphore's SCADA System products-- T-BOX RTU and Kingfisher RTU product lines -- will be on exhibit at ACE08 at Booth 3051. 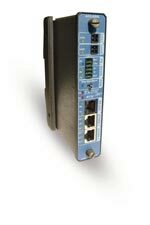 The T-BOX RTU is the first IP-based telemetry solution that enables the complete integration of SCADA, control, and communications functionality in one rugged package. It leverages easy-to-use Web technologies and inexpensive public networks for decentralized, monitoring and control systems. T-BOX products offer up to 50 percent less total installed cost per point versus traditional SCADA / PLC systems and permit greater organizational access to data through automated reporting and browser software. The Kingfisher RTU line provides many advanced features for SCADA system solutions, including redundant configurations, intelligent I/O, and open programming that is compliant with IEC 61131-3. Kingfisher is also the first RTU product line that is compliant with IEC 61499, the distributed processing and interoperability extension to IEC 61131-3. Shimadzu's TNP-4110 Series online analyzers, which are capable of sampling, pretreating, digesting, and analyzing samples, will be on display at Booth 1446 at ACE08. Easy-to-handle and simple-to-maintain, the units are intended for use as automatic analyzers for water quality regulations governing total nitrogen and total phosphorus currently being prepared for implementation. The devices can analyze multiple streams and parameters without bringing samples to the laboratory, and they incorporate automatic calibration using standard on-board solutions as well as user-defined calibration checks and measurement conditions. Measurement ranges from ppb level to thousands of ppm. ACE08 visitors will find the Hach Source Water Monitoring Panel at Booth 809 of the exhibit hall. The panel can continuously monitor the quality of incoming water. It is pre-engineered for quick startup and provides a representative sample to all sensors. Multiple sensors are mounted in an easy-to-install sampling trough, allowing operators to better anticipate process changes related to storms, algal blooms, industrial discharge, chemical spills, reservoir stratification/destratification, construction activity, sewage spills, and other natural or man-made occurrences. The device can be configured to meet customer needs, measuring up to six possible parameters including organics, ammonium, pH, conductivity, oxidation reduction potential, turbidity, dissolved oxygen, and nitrate. The Trident® HS system will be part of the Siemens Water Technologies exhibit in Booth 1517 at ACE08. The multi-barrier packaged treatment unit addresses the Long Term 2 Enhanced Surface Water Treatment Rules and other regulations. A unique high rate, two-stage clarification system removes both settling and non-settling solids while providing built-in redundancy. After clarification, treatment is completed with an integral media filter and ultraviolet disinfection unit. A to-scale model showing the four major treatment stages will be on display. Since its introduction in 2005, the system has continually proven its effectiveness at reducing turbidity, color, and total organic carbon in surface water supplies. The unit provides exceptional pretreatment for NF/RO high-pressure membrane systems. The two-stage clarifier may be used to provide micro- or ultra-filtration membrane pretreatment. ABLOY® High Security Locking Solutions' SHUT-OUT ® Defender will be showcased at Booth 2247 during the ACE08 exhibition. The product is the high-security solution for residential water revenue control. Residential theft from water and gas utilities has been an increasing issue. The company designed the patent-pending SHUT-OUT ® Defender to prevent redirection of piping to bypass residential meters. 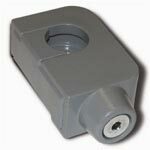 The device fits snugly over the meter coupling nut, defending against theft and delivering maximum asset security. Constructed of hardened steel, it features a High Security ABLOY® cylinder with steel body and hardened steel, chrome-plated face. All component parts are highly resistant to wear, dirt, moisture, corrosion, and freezing. 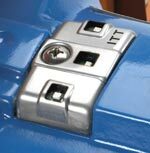 The spring-free construction prevents the locks from jamming and ensures smooth operation. Patented key control with the ABLOY ®EXEC key series restricts key duplication to authorized personnel. Coupled with the ABLOY® systems' extensive master-keying possibilities, this provides for a secure and operationally convenient system. The Department of Watershed Management for the city of Atlanta has authorized the Pitometer Group of ADS Environmental Services to conduct demonstrations of its Large Diameter Leak Detection Services. These demonstrations will be held at the ADS Booth 1849 on Tuesday, June 10. ADS specializes in leak detection services for large water transmission mains and non-ferrous pipe where acoustics present a challenging environment for leak detection. Through an exclusive partnership, ADS provides these state-of-the-art leak detection services using the Echologics LeakFinderRT Large Diameter Leak Correlator. A leak correlation will be conducted on approximately 1,300 feet of 30-inch water distribution line located on Marietta Street, five blocks from the Georgia World Congress Center. The correlator sensors will be placed on hydrants on the north end of the line near Simpson Street and on the south end making a 90 degree turn onto Centennial Olympic Park Drive adjacent to the Embassy Suites Hotel. A brief baseline survey will be taken and then a hydrant located on the corner of Marietta Street and Latimer Street will be flowed briefly through a ¾-inch needle valve to simulate the leak to be correlated. We anticipate being able to transmit the live results of the correlation onto a large plasma monitor at the booth if reception allows it, or the groups will be ushered to the “leak” hydrant a few blocks away to see the correlation in person. This non-intrusive technique requires only a static connection to the water via the hydrants and requires little up front preparation.